Yesterday, civil rights leader John Lewis, a Democratic congressman from Georgia, became the latest advocate to excite the racial debate, condemning Sen. John McCain for "sowing the seeds of hatred and division" and accusing the Republican nominee of potentially inciting violence. In a provocative twist, Lewis drew a rhetorical line connecting McCain to the segregationist Alabama governor George Wallace, and through Wallace to the 1963 church bombing in Birmingham that killed four girls. McCain voiced outrage at the comments, which also drew a mild rebuke from an aide to Sen. Barack Obama. A "provocative twist"? Is that the best Kornblut can do? The liberal media are sufferiing from an achingly obvious double standard, and they just can't be that blind to it. On March 21, Rep. John Lewis took to the House floor and compared the Republicans to the Nazis, paraphrasing an anti-Nazi saying from World War II: "They're coming for our children, they're coming for the poor, they're coming for the sick, the elderly and the disabled." No network considered it news that night to report a liberal Democrat had labeled the GOP as Nazis. When NBC's Jim Miklaszewski aired Lewis's remarks on the March 22 Today show, he followed with Republican Clay Shaw calling them "an outrage." Then, Miklaszewski amazingly suggested the attack was acceptable political discourse by dismissing it: "Outrage or not, Democratic attempts to paint Republicans as heartless budget cutters are beginning to hit home." The closest thing to network criticism of Lewis's remarks came from Miklaszewski and Bob Schieffer calling the debate -- the debate, not Rep. Lewis -- "nasty." On ABC's Good Morning America, Bob Zelnick simply termed the debate "emotional." The Lewis outrage was not a one-time occurrence, but a recurring theme of the Democrats that's yet to spur any media scrutiny. A few weeks back, Rep. Charles Rangel compared Republicans to Nazis in a letter to Rep. Bill Archer -- no network coverage there. In December, Jesse Jackson declared: "The Christian Coalition was a strong force in Germany. It laid down a suitable, scientific, theological rationale for the tragedy in Germany. The Christian Coalition was very much in evidence there." No coverage followed on ABC, CBS, or CNN; NBC simply mentioned the slander. Comparing the modern Republican Party to hate-filled slaughterers of millions simply does not strike the network types as far-fetched, no matter who says it. Lewis yesterday used a racial frame to leverage one of the harshest cases against McCain this year. "As one who was a victim of violence and hate during the height of the Civil Rights Movement, I am deeply disturbed by the negative tone of the McCain-Palin campaign. What I am seeing reminds me too much of another destructive period in American history," Lewis, 68, wrote in a statement. Wallace "never fired a gun," Lewis added, "but he created the climate and the conditions that encouraged vicious attacks against innocent Americans who were simply trying to exercise their constitutional rights. Because of this atmosphere of hate, four little girls were killed. . . . Senator McCain and Governor Palin are playing with fire, and if they are not careful, that fire will consume us all." McCain, who has repeatedly hailed Lewis as a personal hero, immediately called the comments "shocking and beyond the pale." Obama's spokesman, Bill Burton, distanced the campaign from Lewis's remarks, saying Obama "does not believe that John McCain or his policy criticism is in any way comparable to George Wallace or his segregationist policies. 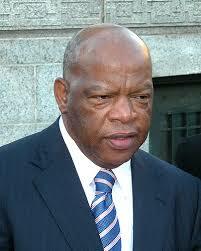 But John Lewis was right to condemn some of the hateful rhetoric." But Kornblut and her editors tried to make this about "racially tinged remarks" on both sides, grasping at straws like the use of "Barack Hussein Obama" on the stump, Sarah Palin’s "palling around with terrorists" line about Ayers, and the "that one" debate snippet to somehow compare to John Lewis. McCain also complained that Lewis had launched "a brazen and baseless attack on....my character and the thousands of hardworking Americans who come to our events." Those words didn't make the Post account.